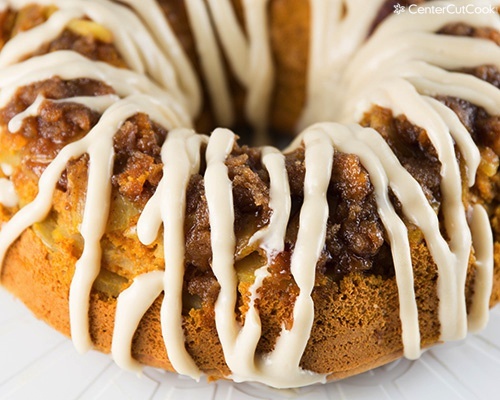 Pumpkin Apple Spice Cake with Cream Cheese Glaze is just oozing with the flavors of Fall and comes together quickly with the help of a box of Spice Cake Mix! Two of my absolute favorite flavors of fall are without a doubt, pumpkin and apple, yet it’s not very often that I see these two flavors combined. 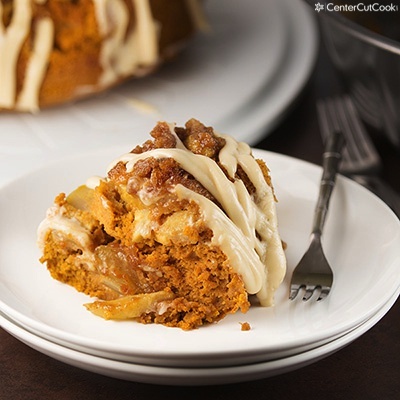 I decided to take this matter into my own hands when I came up with this recipe for Pumpkin Apple Spice Cake with a Cream Cheese Glaze and I’m glad I did. This cake is just oozing with all of my favorite flavors of Fall! I got a lot of positive feedback from all of you a couple of weeks ago when I shared a recipe for Devil’s Food Cake Mix cookies. The message I generally got was that you really appreciated how easy they were to make, and that you were a fan of taking a little help from the store and using cake mix to make something delicious. With that in mind, I decided that this Pumpkin Apple Spice Cake would be based off a box of Spice Cake Mix from the grocery store. It comes together fast, yet looks SO impressive! The method is simple and easy! 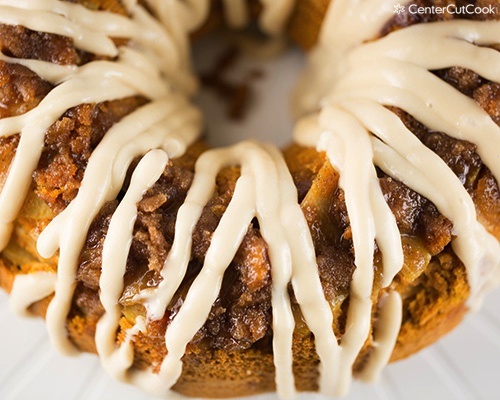 You’ll start by arranging some apples, brown sugar, cinnamon and butter on the bottom of a bundt pan. 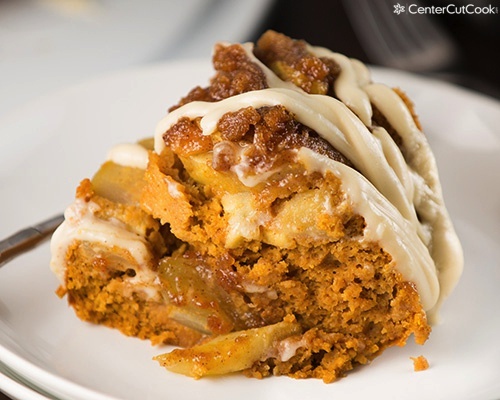 With your mixer, you’ll combine the Spice Cake Mix (I used Betty Crocker), water, eggs, oil, and a 15 ounce can of pumpkin and pour this mixture over the apples. Into the oven it’ll go for 45-50 minutes to bake! I let this Pumpkin Apple Spice Cake cool for about 10 minutes after it came out of the oven before flipping it onto a plate. While the cake cooled, I made a cream cheese glaze to drizzle on top and it compliments it superbly! A couple of tips: Make sure you grease your bundt pan *really* well, otherwise the cake will stick to the sides of the pan. Pre-heat your oven to 350. Grease a 12-cup (or larger) bundt or flute pan really well, or spray it with non-stick cooking spray. If you do not grease the pan well, the cake will stick and will not easily remove from the pan. You can never over-grease a bundt pan! Poor 5 tablespoons of melted butter on the bottom of the pan. Sprinkle brown sugar evenly over the butter. Arrange apple slices on top of the butter and brown sugar. Sprinkle apples with cinnamon. 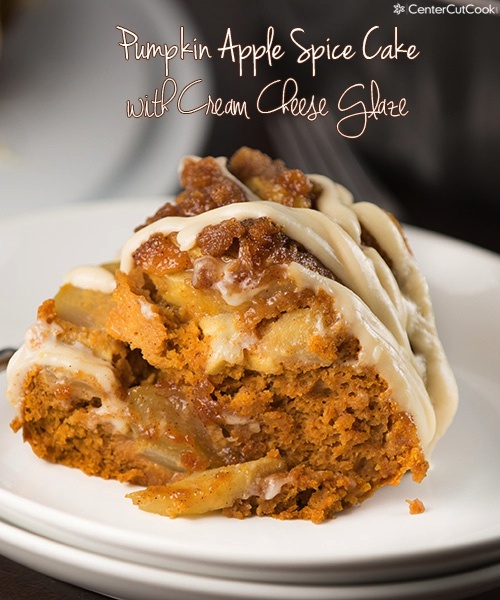 With your mixer, beat together cake mix, water, eggs, vegetable oil, and pumpkin. Mix on low for about 30 seconds, then beat for about 2 minutes on high. Pour the cake mixture over the apples and bake for about 45-50 minutes (even as long as an hour, depending on the type of pan you’re using), or until a toothpick inserted in the center of the cake comes out clean. Run a knife around the edge to prevent the cake from sticking. Allow the cake to cool on a wire cooling rack for 10-15 minutes before carefully flipping it onto a plate. While the cake continues to cool, make the cream cheese glaze. Beat 4 ounces cream cheese until light and fluffy. Add in confectioners sugar and vanilla and mix well. Add in milk, one tablespoon at a time until you’ve reached the desired consistency for the glaze. It’s going to be slightly runny but will firm up as it sits on the cake. Transfer the glaze to a plastic bag, snip the corner, and pipe the glaze over the cooled cake. Cut into slices and serve.